January | 2013 | Art of Living, Sri Sri Ravi Shankar and My Self! With the increase in violence in the societies all over the world, it is time that Spiritual leaders take steps to effectively stop it. Sri Sri Ravi Shankar has always been in the forefront on how spirituality can help reduce violence in the society, schools and in general. The failure of spiritual communities to present values in a more acceptable language to the young and constant rebuffing of traditional religious spiritual values has contributed to the society’s degeneration in a big way. He says everyone of us have a responsibility to bring this change and the spiritual leaders should step up and show the way. The recent shootings in the high schools have left us all in shock and stressed. We can all talk about what changes need to happen and how it needs to happen. But who has to make it happen? It is US. We need to step up and take responsibility in any way we can. Just a small step like stop buying violent video games or signing a petition to bring in gun control can go a long way. As a step towards this initiative there is a Google Hangout with Sri Sri Ravi Shankar on Jan 26th at 10 am EST/7 am PST/3 pm GMT where he will discuss about these issues. Everyone is welcome to join the Hangout! Below are the details. 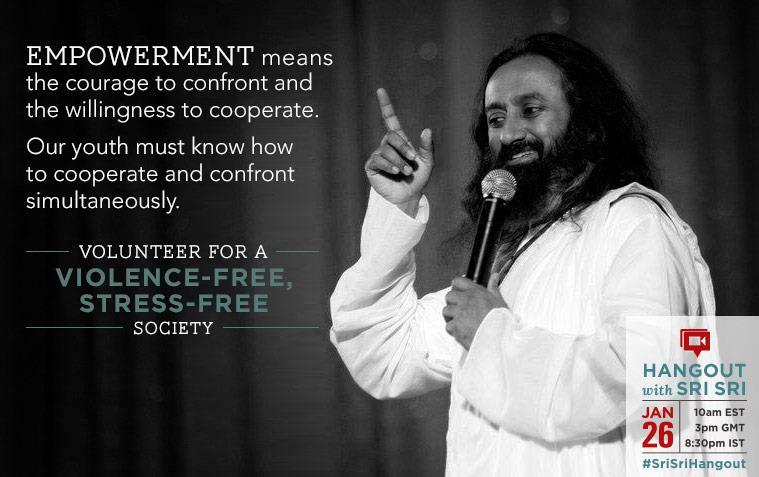 Google hangout with Sri Sri Ravi Shankar for a Stress Free, Violence Free society! This is going to be the biggest online event till date with more than 4000 members and counting! I will be there! Will you? How to deal with people who have a BIG Ego? I was reading a few knowledge sheets of Sri Sri Ravi Shankar when I came across this one about ego. Thought it is better to share this to others. Enjoy! Q: How to deal with people with a very big ego, especially when their behavior is affecting life and others in a bad way? Sri Sri Ravi Shankar: Let them have a big ego, why are you bothered? You nurse an even bigger ego than them, there ends the story. In fact you will find you have a bigger ego, I tell you. Let others have an ego, so what? Why do you sign on a contract of destroying everybody’s ego, or making everybody’s ego smaller? If someone has a big ego, nature will teach them. One day or the other, they will become miserable. Leave it to them. Let them enjoy the music. Why do you become so miserable looking at the ego of others? I don’t understand that. You do what is required of you, as much as you can do, and move on. That is it. In life we should just move on. If someone is nasty to you, you can get up and shout at them, or scream at them, ‘Why did you do this thing to me yesterday; the day before and ten years ago?’ But I tell you, you are certainly spoiling this moment as well by talking about a mistake that happened yesterday or a month ago. You are spoiling the beauty of this moment. I would want you to make a decision right now, ‘I don’t care what happened in the past, right now I am not going to spoil this moment’, finished. The world is like an ocean, these sort of things happen. They happen and they go away as well. Friend become enemies and enemies become friends for no apparent reason. See, whether someone becomes your friend or your enemy, it all works on the strange laws of karma. That is why, put them all in one basket and relax. This, I have adopted as my policy. You do so much good to one person and still if that person is angry with you, or they blame you, what do you do? So, don’t go on chewing on that and spoil the present moment with the past. Isn’t that a good idea? This moment let us celebrate. Deal with your things, that is your karma. This is what the ancient people used to say. They would never sit like counselors and listen to all your stories. They’d say, ‘Come on, wake up this moment; now (snapping his fingers)’, and that would bring a huge change in the mind, in the energy, and in the time. But you don’t start doing that right away, then you will be called the most insensitive and rude person. Got it? Top 10 Brain damaging habits! I had earlier written a post on bad habits and on how to deal with them. Sri Sri Ravi Shankar says that we can take the help of different emotions we go through to fight against bad habits. Here is a link to that post. http://wp.me/p2LxU9-2L. 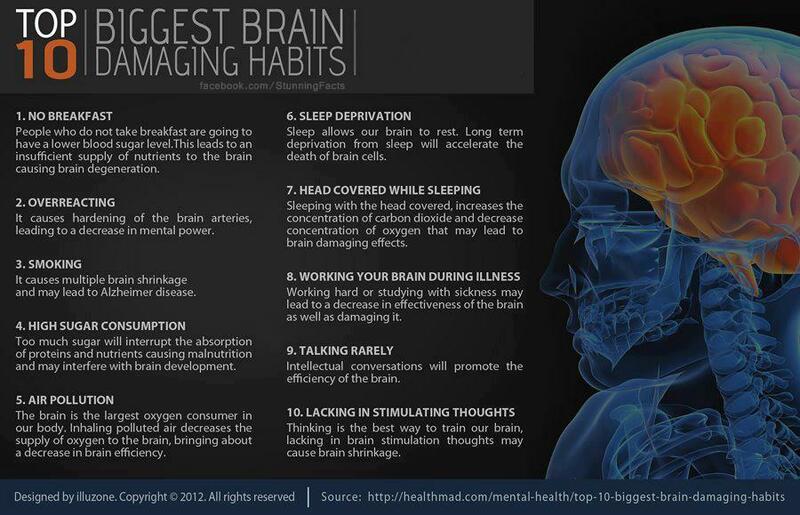 Here is an image giving the top 10 habits that we have that causes damage to the brain. Habits that can damage the brain! Some of the interesting things that fall into the top 10 are Not having breakfast, head covered while sleeping and talking rarely! Smoking is a no brainer :). Which of these do you have 🙂 ?!? 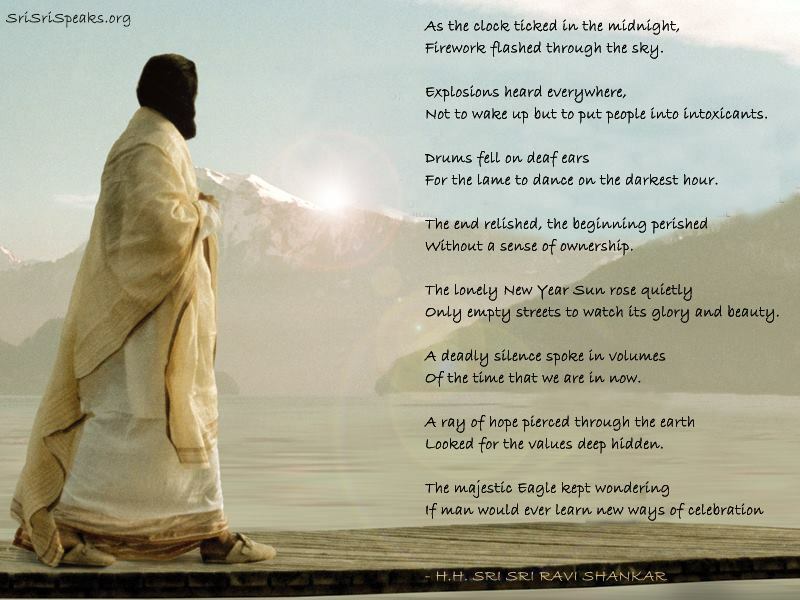 A poem by Sri Sri Ravi Shankar! Each new year, people wish each other happiness, prosperity and peace, but only a few seem to know how to be peaceful — like only a few know how to make money. Here are some steps that might help one to find the most needed inner peace. Often, we become so engrossed in our day-to-day activities, we simply end up gathering more and more information, and do not take time out to think and reflect. Then we feel dull and tired. A few quiet moments everyday are the source of creativity. Silence heals and rejuvenates and gives you depth and stability. Sometime during the day, sit for a few minutes; get into the cave of your heart, eyes closed, and keep the world away. Taking some time for yourself improves the quality of your life. See the impermanence in this life. Millions of years have passed and millions more will come. Nothing is permanent. In this broad, universal context, what is your life? It is not even a drop in the ocean. An awareness dawns, and you will stop worrying about little things. All smallness will simply drop and you will be able to live every moment of your life. When you review your life in a broader context, the quality of your life improves. 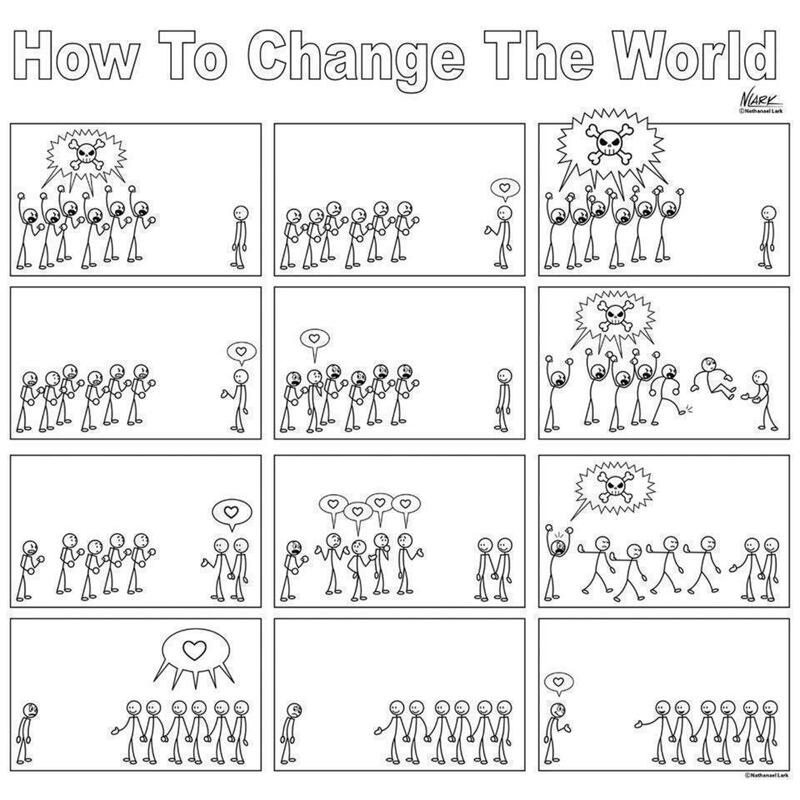 Make a commitment to make this world a better place to live. Do some acts of kindness without expecting anything in return. Service alone can bring contentment in life. It creates a sense of connectedness. When you bring some relief to someone through selfless service, good vibrations come to you. When you show kindness, your true nature, which is love and peace, come to the surface. Every day, every morning, look at the mirror and give a good smile to yourself. Don’t let your smile be snatched away by anybody! Usually, you give your anger freely and smile rarely, as though a smile is costly. Make your smile cheaper and anger expensive! When we have higher goals in life it leads to stress and restlessness, which can be released through a few minutes of meditation and introspection. Meditation gives you deep rest. The deeper you are able to rest, the more dynamic you will be in activity. • Mind without agitation is meditation. • Mind in the present moment is meditation. • Mind that has no hesitation, no anticipation is meditation. • Mind that comes back home to the source, which is peace and joy, is meditation. Know that you are a student forever. Do not underestimate anybody. Knowledge may come to you from any corner. Each occasion teaches you and each person teaches you. The world is your teacher. When you are always looking to learn, you will stop underestimating others. Humility will dawn in your life. Our love, faith and belief should be deep-rooted, and then everything else moves on its own. The feeling that “I am blessed” can help you overcome any failure. Once you realize that you are blessed, then all the complaints and grumbling disappear, all the insecurities disappear and you become grateful, contented and peaceful. Does God maintain Facebook? Every face is God’s Book! Sri Sri Ravi Shankar celebrated the new year with everyone in Berlin, Germany. He conducted a new year meditation and gave out his new year message. The video of the talk is below. Enjoy!